The New 2016 Z-Bash Weekend! 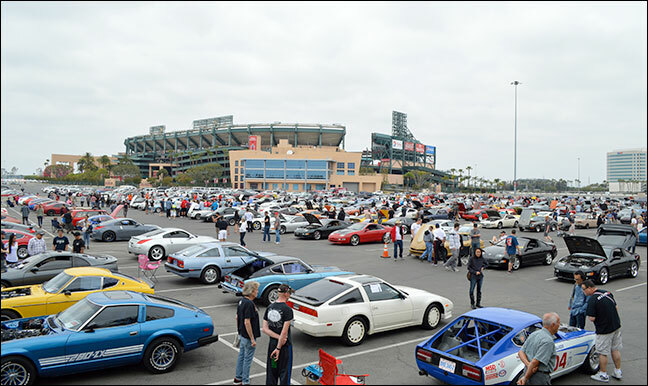 The image above of Angel Stadium of Anaheim full of Z-Cars will take you to the image gallery of the main show area on Saturday, May 14th, 2016, right down the street from our store in Orange (note that it may take a while to load over 300 images!). 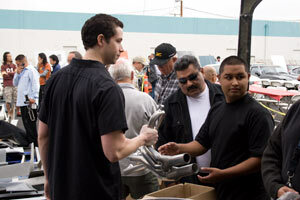 To see details about all that went on at the New Z-Bash, go to our Main Z-Bash page in our online store, The Z Store. 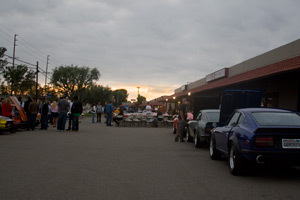 Since the New 2016 Z-Bash was once again a 3-day weekend, the image below takes you to the image gallery covering the Friday Night Kickoff, The Z Parade before the show parking on Saturday, the awards, and even a couple of images from Sunday's Track Day at Willow Springs. As always let us know what you think about Z-Bash at zbash@motorsportauto.com. Keep checking back on our Z-Bash page at The Z Store for videos of the event, coming soon! Greg did make his annoucement about the 2016 show, but some may have missed it. You can follow all updates for Z-Bash 2016, an all future events, on the show page of The Z Store. 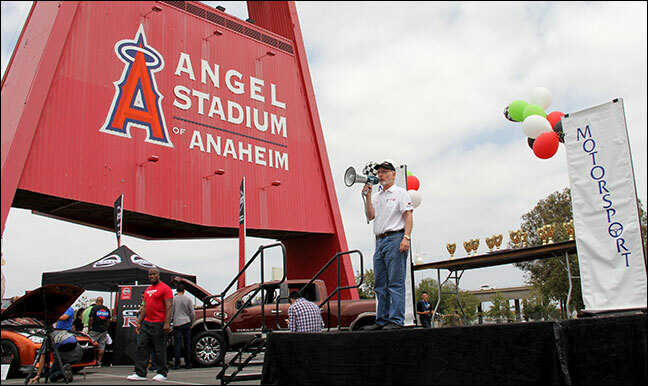 To see more of what happened at the 2015 mini-event, just click the image below. The rains cleared out early Saturday morning well before the Z's started to line up, and it was a great day. 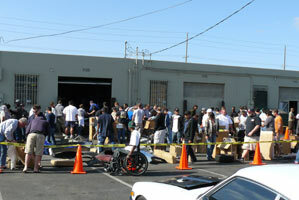 Z-Cars, Z-parts, Z's on the dyno, all with free pizza... We hope all had a blast. See galleries from Z-Bash as well as the associated events below. Read on to see what you missed! 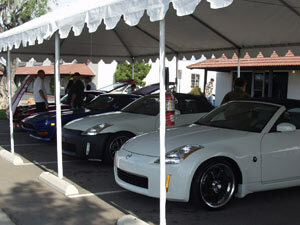 Both of our parking lots and the streets in front of and around our shop were filled with awesome Z's. There were also some great associated events sponsored by Group Z and Fairlady Generations. The image gallery from these events is below, and you can see the list of events that took place in the next section farther down the page. Just in case you didn't stop by for Z-Bash, here is what you missed. 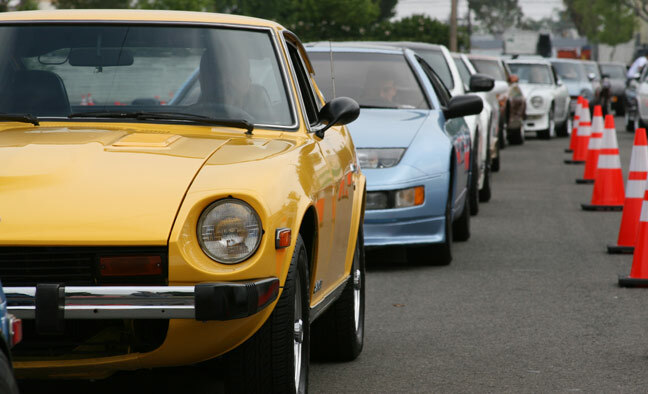 The Gathering of the Z's: The main attraction is always the Z-Cars. As you saw if you were here, there is still lots of room to line up lots of great Z's to check out. The day is centered around one thing, awesome Z's. The Motorsport Garage Sale: From discontinued items, to scratch & dent parts, to overstocks and more, all at blowout prices... It was crazy! The Z-Bash Dyno Day: We had a great Dyno company lined up so you could test the current performance of your Z right at Z-Bash quickly, easily, and for a great price. The Z-Bash Showroom Sale: Great deals on select new parts were ONLY available to those who actually came to the showroom at Z-Bash. 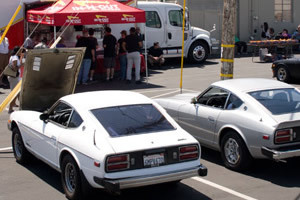 The Z-Bash Free Lunch: What is better than enjoying Z-Cars at a show? Enjoying Z-Cars at a show with pizza. Not cheap pizza either, if you weren't here, you missed Papa John's! Associated Local Events: Some great associated events by our friends at Group Z Sports Car Club (see the next section below for details). While we can't fit quite as many cars in our parking lots as on Collins Avenue during the Nationals, we dont' have to pay the city a fortune to close the street, so Z-Bash parking was FREE for all Z-Cars! In addition to the parking lots, the surrounding streets were also be full of great Z's ready for your camera, and fellow enthusiasts ready for your questions and discussion (often the best part!). To add even more fun to the weekend, the great folks at Group Z had Z-Bash companion events on Friday evening, before and after Z-Bash on Saturday, and even an event on Sunday. The Group Z Grand Prix: Group Z hosted a Z-Car karting challenge at K1 Speed in Anaheim, on Friday, April 25th, 2014, from 5:30pm to 9:00pm. If you've never experienced this type of karting, you might be surprised at the competition. The "Grand Prix" event included a 12 lap practice, 14 lap qualifying, and a 16 lap final race. Trophies were be awarded for the top 3 finishers. To see some of what you missed, visit www.k1speed.com. 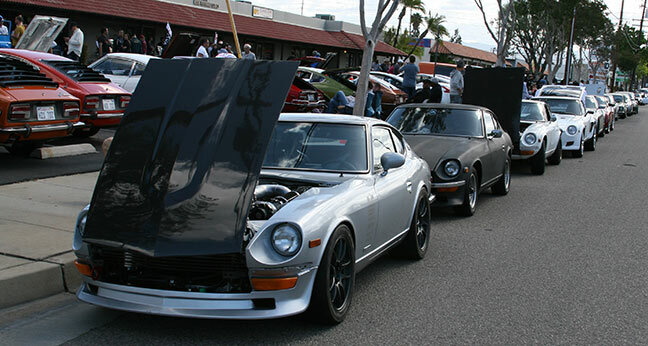 Cars And Coffee Irvine: On Saturday, April 26th, 2014, Group Z and Z-Bash met up at Cars And Coffee. If you've never been to one, it is worth the effort. You might see every kind of car imaginable from Model T's to Exotics. This event happened Saturday morning before Z-Bash, from 6:00am to 7:30am. Irvine is a few miles south of Motorsport. 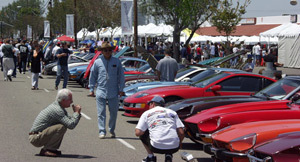 For more information, visit www.carsandcoffeeirvine.com. 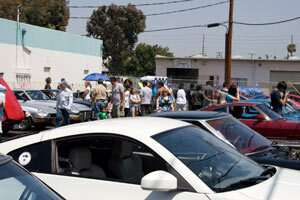 Santiago Canyon Run: Group Z and Z-Bash attendees lined up after Cars And Coffee, and drove to Z-Bash. Santiago Canyon is a gorgeous canyon drive with lots of turns that all can enjoy. Fairlady Generations Cruise: On Sunday, April 27th, from 8am to Noon, Fairlady Generations had a local meet & cruise event. 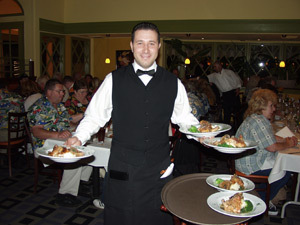 For details visit their events page at facebook.com/events/275753455933932. 18th Annual Motorsport Auto Z-Car West Coast Nationals! 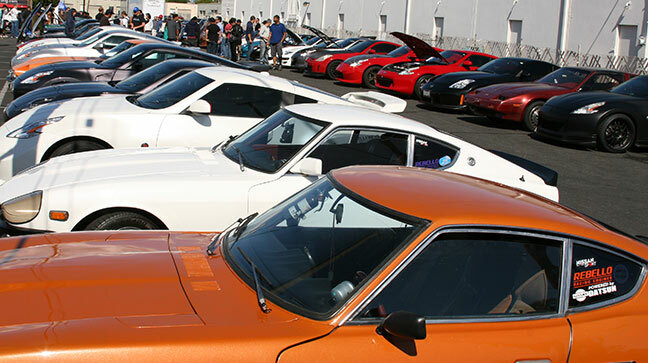 18th Annual Z-Car West Coast Nationals Awards! We ran into a number of technical difficulties in creating this simple gallery of the winning Z's and their happy owners, but were finally able to fix the problems and post them here. Congratulations to all! 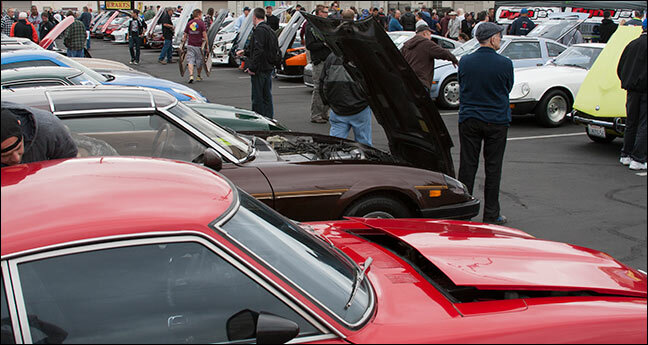 The 18th Annual Motorsport Auto Z-Car West Coast Nationals Car Show was a great example of why we all love Z-Cars. The quality of the cars was excellent, and partially completed projects proved just as interesting as those that were finished! 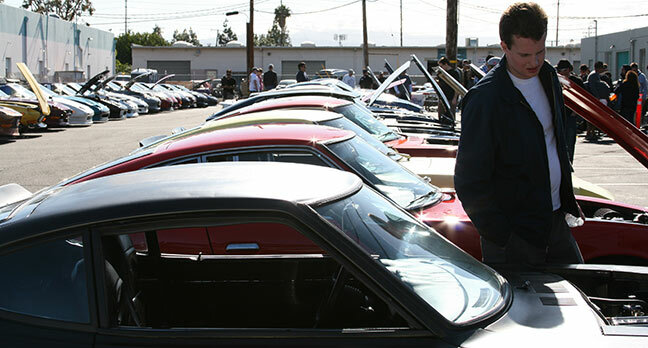 Whether you're more interested in restored Z gems, or custom concept Z's, there was plenty to look at and ideas to discuss with willing participants. Once again for this year, the images are in order of time, as if you showed up for the Kick-Off party on Friday night, and stayed through the big show awards on Sunday afternoon. We had three different photographers at different times, and while our main photographer is freelance, he is a Z-Enthusiast, and took images of whatever caught his eye. So some cars might have more angles than others, depending on what stood out to each photographer. Hopefully this matches what you would do if you walked the street at the Nationals. We tried to catch all of the Z's at least in some way. Even with almost 900 photographs below (not including the awards), we still didn't catch every cool engine, interior, body creation, or perfect stock restoration, but hope you enjoy some of them through our photographer's eyes. We'll let you review the show images out for a time, you can decide on your own favorites, and we'll post the award winners, and as many of their Z's as we were fast enough to catch. Please note that each gallery below has around 300 images, so they may take a minute to load initially, depending on your internet connection and network traffic. Each will open in a new window. The Standard galleries are recommended for slower connections or smaller monitors/resolutions (below 1024x768). Adobe Flash is required for the large galleries, which will take longer to load. If the first image doesn't show up immediately, please be patient. The Flash galleries also have automatic slideshow controls on the bottom right of the screen. The 2013 Motorsport Auto Z-Car West Coast Nationals Image Galleries! The First Annual (2013) Motorsport Z-Car Show Ride Along! 17th Annual Motorsport Z-Car West Coast Nationals Car Show! 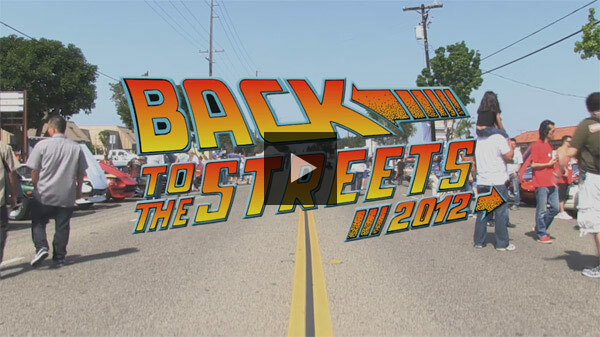 This short video shows only a very small portion of the hundreds of awesome Z's that were there on the final day of the Nationals, the Back To The Streets Z exhibition, on Sunday, April 29, 2012, on Collins Avenue in Orange, California. This video shows the full awards presentation, followed by the award winning Z's themselves (Just want to see the cars? Skip to 27.56). The main class awards were voted on by others registered in the same class. 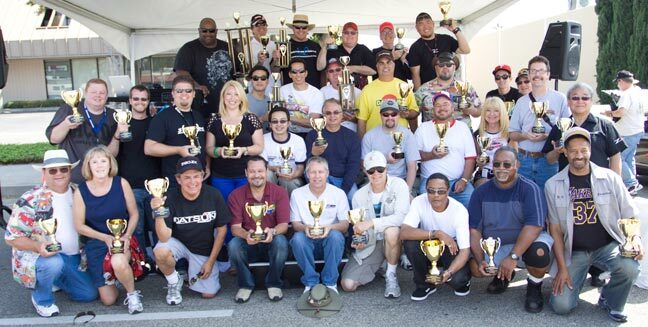 The "best of" awards were voted on by Sport Z Magazine (now a part of Grassroots Motorsports). So many put in so much time and love into their cars, we wish they all could win trophies. 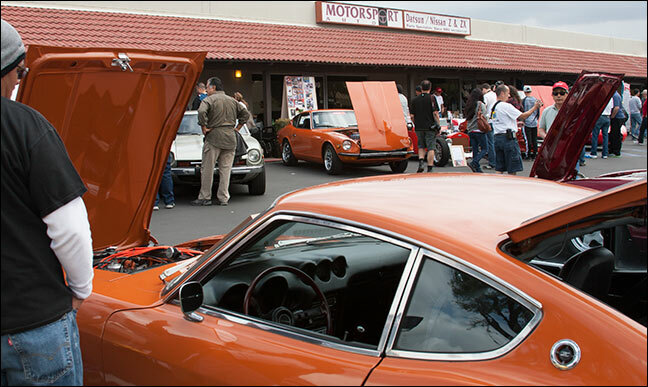 17th Annual West Coast Nationals Review & Car Show Images! 2012 Motorsport Auto Z-Car West Coast Nationals Award Winners! 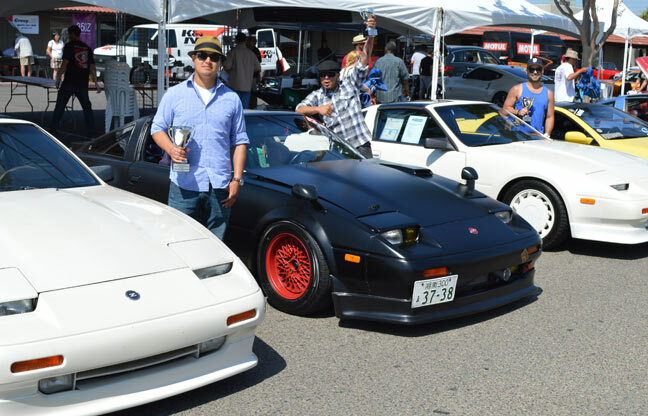 The Z-Car West Coast Nationals is all about loving the cars, not winning awards... But it is still fun to win! 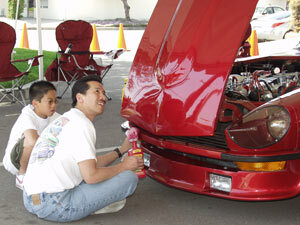 In our survey before the "Back To The Street" Show, there were almost as many votes for just enjoying the cars without the awards, as there were votes for keeping the awards. So while we are a bit late in posting the awards (please accept our apologies), here are your 2012 Show Awards Winners! The Galleries first display all of the Award Recipients (Congratulations to all). Then, the Award Winning Z's, by model, in no particular order (they are all winning Z's!). Remember that the class winners were decided by peer voting (other entrants in the same class), and the overall category winners were decided by Nissan Sport Magazine. The Flash gallery (Adobe Flash Player required) is an automated slideshow. Note the slideshow controls at the bottom right corner of the gallery window (the slideshow is turned OFF by default, click the "play" button to start, or browse manually). Hold the mouse over part of the image to see the caption for that image. You may also click the question mark in the slideshow controls to show this information all the time (Recipient names/etc.). The 2012 Motorsport Auto Z-Car West Coast Nationals Awards! The 2012 Motorsport Auto Z-Car West Coast Nationals was a great "return to the roots" for the car show. 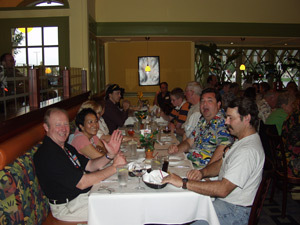 Many had expressed their desire to have the show back on the street where it all began, that it was more "intimate", and just seemed fitting for the Z. For the first Z-Car West Coast Nationals since 2009, and the first on the street since 2006, it was a great turnout. For the images taken of the show this year, we decided to give you the whole experience by timeline, as if you showed up for the Kick-Off party on Friday night, and stayed through the big show awards on Sunday afternoon. The first 81 images of the 311 in Gallery One below are of the Friday and Saturday events (Z's at the Kickoff, Z's at the Dyno, etc). From the start of the Sunday show at image 82 all the way through the end of Gallery 2, over 540 images later, are all car show images! We tried to catch all of the Z's there in some way, and hope you enjoy them. As far as the Car Show, the first Gallery shows the Sunday morning earlybird lineups (around 7am) and some of the first cars on the street (just before 9am). The second Gallery starts with the "end of the line" of cars waiting to get on the street (just before 10am), and stays on the street right up to the start of the award presentations. We'll let you check the show images out for a short time, and you can decide on your own favorites. Then we'll post the winners, and as many of their Z's as we were able to capture. Note that the galleries are quite large, and may take a minute to load depending on your internet connection and network traffic. If no image shows up to start, please be patient, as each gallery has over 300 images! The 2012 Motorsport Auto Z-Car West Coast Nationals Image Galleries! If you couldn't make the show this year, below are listed all of the events you missed!